The TENMYOUYA Hisashi x indieguerillas exhibition will open at Mizuma Art Gallery on November 25, 2015. Having gained an insight into the cultures that have grown in their respective own countries, both artist have been illustrating folk customs and values in the present age by various means in an incisively critical style. Acting in concert with their time, both have been participating in international art shows, and frequently collaborate with a variety of media. indieguerillas, for whom this exhibition is the first full-fledged showcase of their work in Japan, is the artist couple Miko (1975) and Santi (1977), who have been working under this moniker since 1999. Both graduated from the Indonesian Institute of the Arts in Yogyakarta, where Santi studied visual design, and Miko interior design. 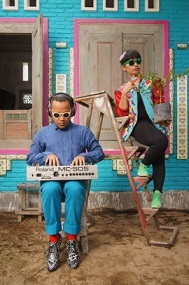 Presently still based in Yogyakarta, they have been referred to as the most successful young artists in Indonesia. Renowned for their profound knowledge and interest in both Javanese folklore and contemporary city life, they produce artworks that have gained a high international reputation for their sophisticated visual effects and experimental ways of expression. Tenmyouya Hisashi established his original “Neo-Nihonga” style translating the characteristic features of Japanese traditional painting into contemporary art in 2000, and proposed Butouha as a means for his struggle against the authoritative art system by way of painting. In 2010, he proposed the new art scheme BASARA as an embodiment of the extravagant and extraordinary basara and kabukimono samurai aesthetic of the Nanboku dynasty and late Sengoku era respectively. At this exhibition he introduces new works in the “Japanese Spirit” series, a representative series of early works that started with No.1 in 1997 and temporarily ended with No. 15 in 2004. The series is themed on stereotyped misconceptions of foreign people about Japan. The artist inflated such images and produced these works based on the assumption that they will be viewed by foreigners. The centerpiece of Tenmyouya’s first solo show back in the year 2000, the series is based on the idea of imaginary human-powered machines . The members of indieguerillas have been greatly attracted to Tenmyouya’s work. Last year that aspiration led to the realization of an exhibition curated by indieguerillas and Tenmyouya in Singapore, for which each side selected their respective own county’s most promising young creators. The latest fruit of their linkage is this double exhibition. In recent years the relationship between Japan and Indonesia has improved rapidly both in the economical and the cultural sector. The show of works by these two popular artists representing their respective countries will exhibit nothing less than a cutting-edge artistic combination that embodies the relationship between both countries today.